There is a sharp, clean feel to the air. Early mist clings to the bottom of the valley, and in the garden browning leaves lie tangled in unmown grass. We start to rake the leaves into long twists braided with moss and twigs. We are clearing away summer. Sheltered in the brazier, the fire lights easily. It licks the garden driftwood then devours the dried storm cast-offs. It settles to a quieter burning, and I throw in an armful of leaves. The flames leap up and I work quickly. Damper matter – moss, mulch and green stems – have also been caught by the rake. I empty a basketful onto the leaf-ember. Thick smoke belches up. The brazier is now a cauldron, boiling and heaving. The occasional flame-lick surfaces from the rolling mounds of smoke. We are burning summer. The ancient twisted oaks that hedge our garden have dispensed with their ‘yearly trick of looking new’ (Larkin: The Trees), each offering of leaves carved as ‘rings of grain’, an annual act of remembrance. 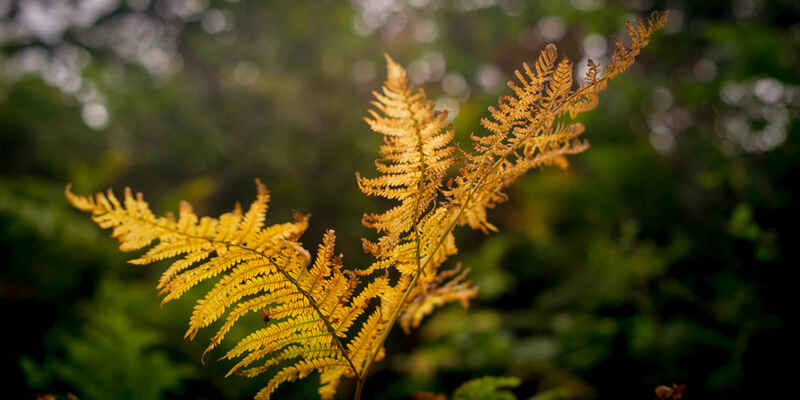 And even as we are lifting this year’s fall, there are already signs of new living – precocious budding perennials and evergreen fronds unfurl from the damp undergrowth. As winter chills the ground these shoots will trade places with decaying fern that has moved to gold and now blackens back into the earth. Waxy holly and reddening berry grow among the oaks. In spring I felt the soft of their new leaves; delicate spikes, flexible and bright. Now they are ready for the frosts. My six-year-old daughter works alongside us, reminding me how I would help rake and sweep the barrowloads of beech nuts that plagued my father’s lawnmower. With a startling clatter they caught in the mechanism of the wheezing contraption then spat out with a growl, bruised and shredded. Today there is a lightness in our work and soon the long leaf-plaits grow smaller. About three basket-loads left now, and soon the remains of summer are gone. 'Today is Nature Day,' calls my daughter, 'and now it’s time for a celebration.' In a corner of the garden, under an oak and around a small painted table, she arranges our seats – a footstool, a folding step and a child’s chair. Out comes a bowl in which she has placed three apples, three tangerines, six custard creams and a lemon, ‘in case we might want some too’. She has climbed to a high kitchen cupboard and fetched the stemmed crystal glasses. In one she has diluted blackcurrant squash and in two others poured red wine from an open bottle left from the night before. 'Here’s to Nature Day!' she says. We toast each other. I want to pour a libation on the ground, for the living and breathing world seems more present now. A sour tang of leaf smoke clings to our clothes and in the distance Loe Bar reaches to the sea. All is calm, and the grey ocean mirrors the flat clouds above.